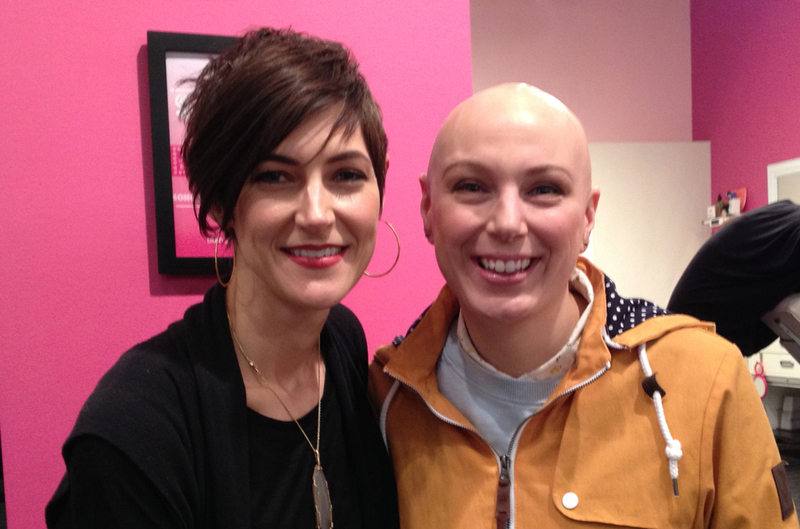 It's All About the Eyebrows - My Makeup Lesson for Alopecia — lady in shred. Adventures with makeup for the girl who never wore any. At first I thought I could teach myself how to wear make-up. I spent a few hours watching YouTube videos and went and bought an all-inclusive make-up kit from Kohls. Then I spent another hour trying to put on gel eyeliner and eye shadow. It looked okay, but I still felt awkward and un-natural. A friend helped guide me in the direction of a makeup boutique in Portland and I discovered that they actually offered make-up lessons. I gave them a call and made an appointment that week at Blush Beauty Bar. I'm sure some women would say that walking into Blush was like being a kid in a candy store. For me, it was more like being a fish out of water. But I was greeted by super friendly staff and encouraged to look around the store until my aesthetician was ready for me. The store itself is beautiful; brightly lit with neatly organized displays. Customers were sampling various lipsticks and blushes, while plenty of staff was available and willing to help with any questions. When Katrina sat me down in the chair and asked what type of lesson I wanted, I slowly pulled off my beanie to reveal my shiny bald head. I told her that I might be a bit of a special case, since I have no hair due to alopecia. She listened to my story and I confessed that I knew nothing about makeup, but wanted to learn an everyday routine that would look natural on me. Katrina was so patient and kind. She really seemed to understand what I was looking for and answered all my ridiculous questions. She would apply makeup to one side of my face while I watched in a hand mirror. Then she would let me do the other side while she guided me. She also let me photograph EVERY stage of our lesson, so I can give you my detailed routine in a later post. There were a few "eye-openers" for me that I came across during our lesson. It's all about the eyebrows! I already knew that they were pretty important for framing my face, but I was astonished at the transformation between my very thin eyebrows to a much more defined brow. Eye liner does not always need to be applied above the lash line. Katrina showed me a technique where you line under the lash line and the effect is much more subtle. Also, eye liner comes in other shades besides black. Cheek bones and apples of your cheeks are two different locations. It turns out that the "bone" is located more towards the outside of your eyes. If I put blush on before, I concentrated on those "apples" and usually ended up looking like a clown. Also, most of the time, you should have your eyes open when applying shadow. Yeah, didn't know that before. I could not have been happier with my make-up lesson. After Katrina showed me how to get my day time look, we played around with some more dramatic styles and she showed me how to glue on false eyelashes and increase the amplitude of what I had already applied. Fake eyelashes will definitely be reserved for special occasions only. I need to take the baby step approach to my make up routine. It has been 2 weeks since my lesson and I have been diligent in applying make-up every day. This has been tough for me because I am used to never wearing any make-up and being able to just get up and go. I just keep telling myself that each day I'm getting better at applying the make-up and each day I will get a little faster at it. It was nice to go through this process during the holidays because I had some extra time off work and wasn't rushed every morning to get my face done up and get into the office on time. If you are like me and not used to wearing any make-up, I would highly recommend starting this process when you have some extra time in your daily routine. I have already cut down my time from 30 minutes to 15. Every day my eyebrows look a little better and my eyeliner is a little more consistent. The make-up lesson has been a very positive experience for me in my alopecia timeline. One of the more difficult aspects of this disease is that people usually think the worst when they see you. Getting a natural looking makeup routine down, was key to helping me boost my confidence when going out in public and interacting with people who don't necessarily know about my background. Thank-you Katrina and Blush Beauty Bar for helping me feel better about myself and making my days just a little easier!